Etosha National Park is undoubtedly one of Africa’s best game viewing areas. This vast park boasts four of the Big 5 in abundance (leopard, rhino, lion and elephant) as well as other crowd favourites such as cheetah, hyena, giraffe and gemsbok. The elephants are possibly the biggest you’ll see in Africa and the rare black rhino is probably more easily spotted here than anywhere else. In fact, Namibia has Africa’s highest population of free roaming rhino. Outside of Etosha itself, you can track these incredible creatures on foot in Kaokoland or Damaraland, where you also find the desert elephant. With such vast, open spaces, the game in Namibia is sometimes more dispersed than in other parts of Africa, but this only makes the sightings all the more special. Perhaps even more of a drawcard than Namibia’s wildlife are the truly breathtaking landscapes that it serves up so unfailingly. 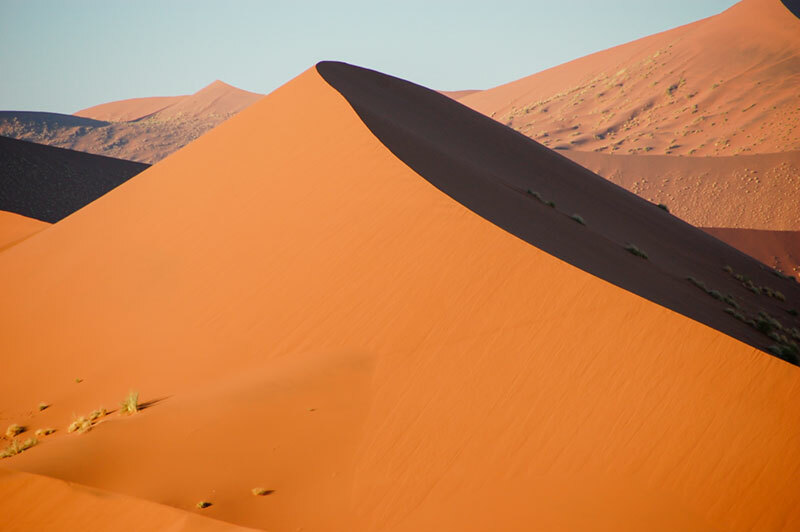 Surely the most iconic of the bunch are the great burnt orange sand dunes around Sossusvlei, which are often said to be the most photographed natural wonder in Africa. Then there’s the harsh, melancholic beauty and the shipwrecks of the aptly-named Skeleton Coast, which forms Namibia’s southern border beyond the desert and dunes. The north of the country around the Caprivi Strip is a different world of lush riverine woodlands and wetlands, while to the south you’ll find the deep, jagged scar of the Fish River Canyon. Namibia’s people are as interesting, striking and diverse as its landscapes, though one might say they’re a lot more hospitable. Many of Namibia’s ethnic groups retain distinctive cultural traits or attire that have survived for centuries. The Himba, for example, are known for their copper jewelry and the elaborate hairstyles they fashion with red ochre, which they also use to cover their skin; the Herero women’s traditional attire, by contrast, is derived from colourful Victorian ladies’ dresses. German and Afrikaans cultures and heritage are equally pronounced and, at times, old-fashioned in certain areas of the country, while in bigger cities like Windhoek you’ll experience more hybridity and multiculturalism. Almost all Namibians are unfailingly warm and welcoming. While Namibia’a people are one of its drawcards, so is the unfailing ease with which you can get away from them and become entirely enveloped by raw nature. Namibia is one of the most sparsely-populated countries in the world, with a total population of just over two million dispersed across a landmass roughly four times the size of Britain, which has a population of more than 60 million. In some parts of the country, you can go hours or even days on end without seeing another human being, or any sign of civilization that might spoil the dramatic vistas and overwhelming sense of isolation. Combine Namibia’s good roads and amenities with its inherently and perennially off-the-beaten-path feel and you have a dream destination for road trippers and self-drivers. There’s enough wildness to satisfy even the oldest hands, but Namibia is also free of many of the risks that might scare away the neophytes in other parts of Africa. Traffic should never be too much of a problem . . .
Namibia is also a generally safe and secure country with minimal crime, and English is widely understood, as is the need for good food, and an occasional drink or two to wash down the memorable days that lie in store for you.